In my efforts to drop a few (okay, a lot) of pounds, I made this jerk spice rubbed tuna that is grilled for under a minute to keep it moist. 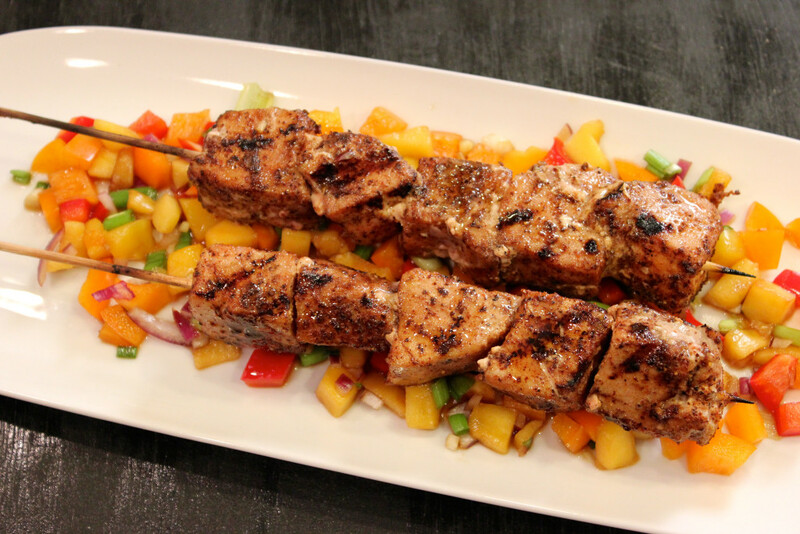 I cool the spiciness of it by serving the tuna on a bed of mango salsa. This Meat On A Stick Monday is light, low calorie, full of flavor, has heart healthy omega 3 fatty acids, a full serving of fruits and vegetables and there isn’t a pound of butter in sight! In my efforts to drop a few (okay, a lot) of pounds, I made this jerk spice rubbed tuna that is grilled for under a minute to keep it moist. I cool the spiciness of it by serving the tuna on a bed of mango salsa. This Meat On A Stick Monday is light, low calorie, full of flavor, has a full serving of fruits and vegetables and there isn't a pound of butter in sight! Dice the mango, pineapple, bell peppers, red onion, spring onions, jalapeño, and ginger and place in a small container or bowl. Add the remaining ingredients and set aside for 2 hours for the flavors to combine. Cut the tuna into 2 inch pieces. Drizzle sesame oil over the tuna. Coat the tuna on all sides with the jerk seasoning. Leave the tuna aside for 30 minutes. Heat the grill to 250ºF. Skewer the tuna using 4 skewers. Sear the tuna no more than 30 seconds per side for a total of 1 minute (tuna cooks very quickly), and you want to still see pink in the middle.